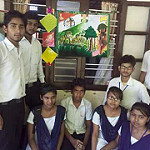 Inter collage one day Wall magazine competition was organized on 13th September. Total 189 participants took part in the competition from 5 collages - Women's collage-78 Tinsukia Collage-23, Janta Collage-20, Commerce Collage-38, Pranavananda Collage-49 students. For the competition there were two judges there - one smt. Baldeep Kaur, Principal Gyanpeeth School and Smt. Rupa Pal - Ex student of Vivekananda Kendra Vidyalaya, Tinsukia, well known artist. competition was started at 9:30am and end at 3:30pm. The competition was followed by ppp, gams and group discussion - "Vyavhar me Rastra Bhakti". And program was concluded with patriotic song.